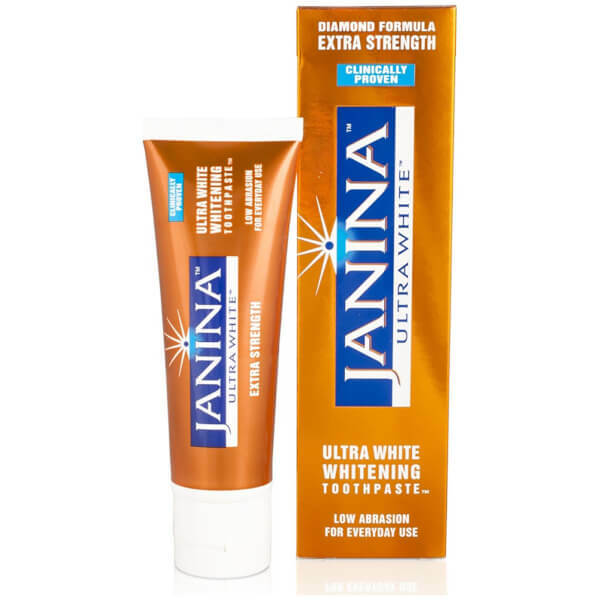 Reveal a brighter smile with the Janina Ultrawhite Whitening Extra Strength Toothpaste; a low abrasion formula that gently and effectively whitens teeth. Safe enough for daily use, the toothpaste thoroughly cleans teeth with a combination of antibacterial agents, which protect against tartar and calculus, whilst preventing plaque development. 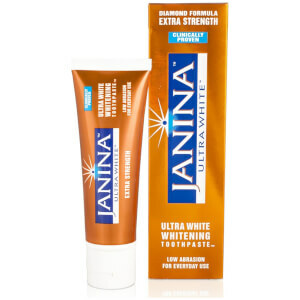 The whitening toothpaste utilises a patented Bromaine Complex, which combines natural enzymes to visibly whiten teeth without using harsh abrasives. 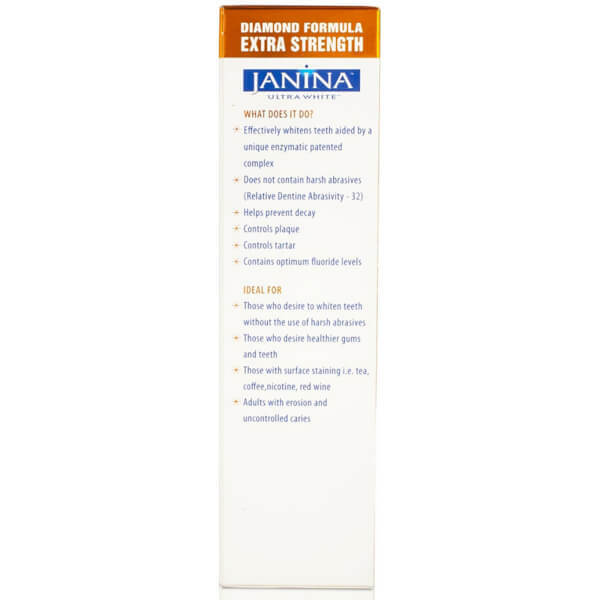 Ideal for those with surface staining or people desiring a brighter smile, the extra strength toothpaste leaves teeth and gums clean and healthy, as well as visibly whiter. For best results use twice daily and preferably for more than three minutes each time. When brushing is complete spit out excess, but for best results do not rinse mouth with water (this allows the formulation to work for even longer). I found the product to work after a couple of days, follow the instructions and you will get guaranteed results. Definitely recommend. After giving this a try I wasn't impressed until about 7 days in. And you really do have to leave some of the residue on your teeth to see a difference. But after about 7 days you will start to see stains melting away. 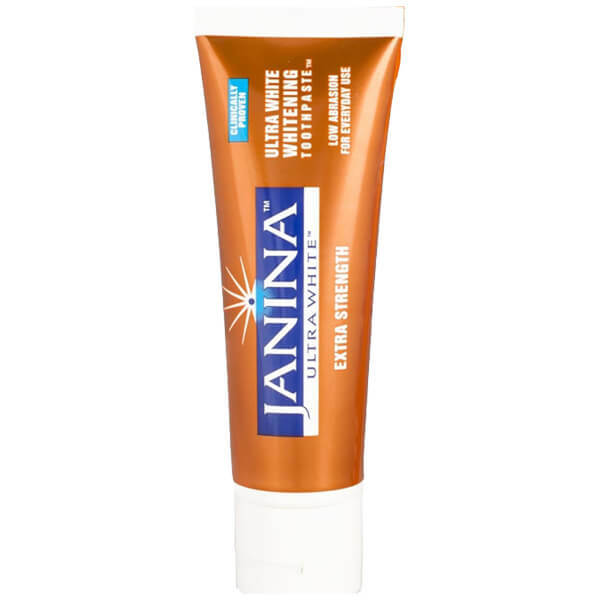 Obviously this won't whiten teeth in the same way a cosmetic bleach will, but it's great for maintenance or ridding the front teeth of tea/coffee/wine sort of stains. I'm not sure about the whitening claims but apart from that a great product. If you follow the usage instructions it leaves your teeth feeling brilliantly clean and also has a really minty flavour which freshens your mouth up a treat! I bought this having read some good reviews about it and it being the only product available in the shops that works so thought I would give it a go. Although I have only been using it for a few days I have noticed that my teeth are looking brighter but it does take a couple of weeks to show the full effects. One of the best I've used. Noticed a difference very fast even had comments from others too. Well worth a buy!